Food Blogga: Who Has Time to Do Preserving? I've Gotta Pack. Who Has Time to Do Preserving? I've Gotta Pack. An oversized red bell pepper from the La Jolla Farmers Market. This post was going to be about the joys of preserving late summer's produce for winter, especially red bell peppers. I had planned on extolling the virtues of making your own roasted peppers -- tastier, healthier, cheaper -- rather than buying them. That's not gonna happen. Finish a chapter in my upcoming book. Edit an upcoming piece for SDNN.com about a local farmers market. Freak out that I have NOTHING to wear for the trip and debate going shopping. Again. Conduct an interview about how to cook tri-tip BBQ. Try not to get sucked into the abyss, otherwise known as Twitter. Make a batch of biscotti that I promised to a friend. What was I thinking? Have a mini-meltdown that I'll never get all of these things done in time and blame it on Twitter. Throw a half dozen protein bars in my carry on, so I can virtuously deny those peanut butter crackers and chocolate chip cookies the flights attendants will heave upon me. Call Jeff and complain that I have NOTHING to wear this weekend. Drink coffee. How else am I gonna get all this stuff done? Hope that my Good Bite video for Quaker Oats is all set cause I had a good hair day when I taped it. Watch the latest episode of Mad Men with Jeff tonight while sipping a gin and tonic with extra lime, because, after a day like this, I've earned it. Lie in bed unable to fall asleep because I'm still fretting about having NOTHING to wear this weekend. Wonder if they sell any good cocktail dresses in the San Diego airport. Oh, and you should definitely make this soup. You'll love it. 1. In a large pot over medium-high heat, warm olive oil. Add onions, and cook for 5-7 minutes, or until lightly browned. 2. Meanwhile, in a small skillet over medium heat, add coriander and fennel seeds. Toast until aromatic, 1-2 minutes. Remove from heat. 3. Add diced roasted peppers to the onions and stir. Add broth and tomatoes, and bring to a boil. Lower to a simmer. Add crushed red pepper flakes, toasted coriander and fennel seeds, and salt. Stir well. Cook for 8-10 minutes. Turn off heat and cool for 5-10 minutes. 4. Puree soup in two batches until smooth, and return to the pot over medium-low until thoroughly heated. Taste it; adjust seasonings accordingly. If desired, add more broth for a soupier consistency. Garnish each serving with some toasted fennel seeds and a drizzle of extra virgin olive oil. Here's how to make roasted red peppers. Of course, for a quicker version, you can substitute jarred roasted peppers. Preheat a grill to high. Place peppers on the grill, rotating several times, until fully blackened (about 20 minutes). Place grilled peppers inside a paper bag and close the top tightly. Place the bag inside a large bowl (to catch any juices that spill out), for about 10 minutes. The steam will help the skins peel off more easily. Remove one pepper at a time. Place on a cutting board, and split open. Remove the stem and the seeds. Using a piece of paper towel, rub the skins off. If you have trouble removing them, then steam them a bit longer; otherwise, they should come off easily. Note: If you don't have a grill, then you can roast or broil the peppers in the oven. You can even place them directly on the burner of a gas stove. 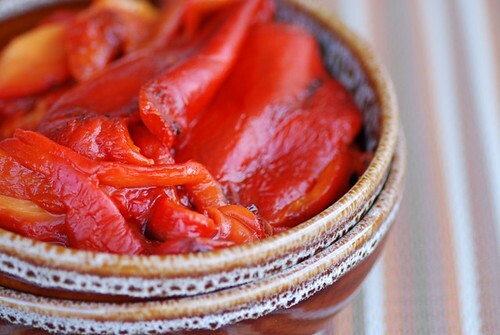 Click here for more about roasting red peppers. 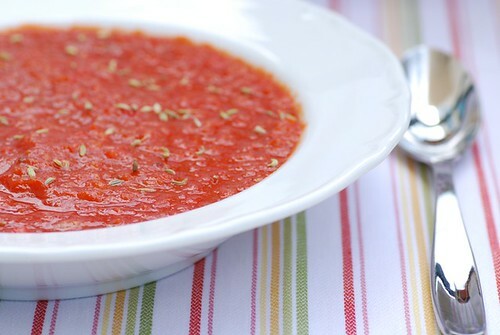 Oh wow that soup looks absolutely colourful and flavorful :) Thanks for dropping by my blog! Have a fun trip to San Fran...its one of my favourite cities! I love bell peppers! Your soup looks delicious! That flavor combo is interesting! What delicious looking soup with that lovely rich red! Have a great time at BlogHer, and all the best with your other projects - you have been very busy! You are too cute! That soup looks divine. Have a great time at Blogher! Have a lot of fun at the conference. And now I'm off to make this soup. The soup looks amazing...can't beleive that you had time to make it with all you've got going on! I want to make that soup so BADLY!! Unfortunately we had crappy pepper weather (and poor tomato turn-out as well thanks to some crazy Tennessee blight that wiped out all the plants over here on the PA/NY border), and NONE of our peppers look like that! Totally go shopping...always, always go shopping for trips. Right now there are TONS of sales. Have fun. I LOVE San Francisco! OMG!! Fennel & Roasted Bell Pepper, two of my very much used & faves together! I hve to do this combo sometimes..
Go shop! & have a great time. Thanks for the link Susan. good luck with the list - hope you have ticked many items off by now - soup looks delicious - bet you will wish for a mug of that when you are on the plane! That soup is my kind of thing (especially topped with a bit of feta - yum!) and that is the biggest bell pepper I have ever seen! Being a Southern girl I did not even know about fennel until recently. It has a great flavor. Will be making this soup and discussing it with my Nutrition and Wellness classes. Have fun this weekend! Have a great time at Blogher Susan. All I remember well from the list oif things to do is 'To call Jeff and tell him you have nothing to wear this weekend'!! LOL...does anyhting else matter!! YUM soup BTW...beautiful! Your list was hilarious! Have a wonderful time. Don't forget to breathe, my dear Susan. Everything will work just fine and you'll have a great time. Have a safe and enjoyable trip. Wow, look at the pepper! Soup looks delicious. And while I've never been to the San Diego airport, I'm betting they DON'T have good cocktail dresses. Just saying. I have never seen a pepper to rival that one. Crazy! I hope your gin and tonic tastes as good as you hoped, that you have a perfect trip, and you find a forgotten dress in your closet that fits the bill. 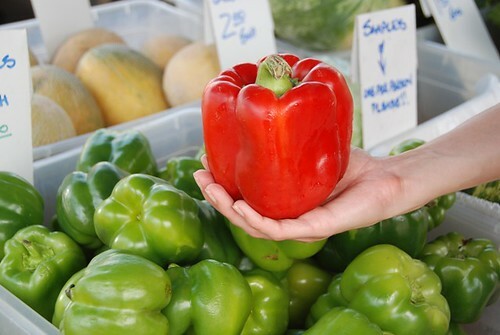 Got a family of bell pepper (aka capsicum here in Oz) nuts, am making your soup this week! Looks fab. Glad to have discovered your blog. I hope you're having a wonderful weekend! And please, post the roasted pepper recipe when you get back. And nothing to wear? Are you kidding? You're so cute you'd look good in a burlap sack. Seriously. Don't sweat it. I'm so jealous of all you guys going to SF, but I really didn't know much about it. (And can't leave right now, anyway!) I think that's a sign that I have too much on my plate! Hope you have a blast! You never fail to make something delicious and nutritious :) (and in this case, super-packed in capsicum flavor!) I hope you had a great time in SFO!